Donald Trump (left), always a boy. Ronald Reagan (right), always a man. Present positive, conservative ideas that are directly linked to the American creed. Promote a big, inclusive tent. Stive to unite, not divide. Donald Trump does none of these. Where Reagan toiled in the vineyards promoting conservative principles for some two decades before he became president, Donald Trump has no principles. What does he believe in, other than that he is smart and everyone else is stupid? Mr. Trump once said that he is “very pro choice.” Now he is very pro life, and even called for incarceration of women who have had abortions. Until he changed his position the next day. Regarding an issue that is really in the news, ISIS, he has staked out a smorgasbord of positions: from seizing their oil fields to bombing their oil fields; from sending in no U.S. troops to sending in a few U.S. troops to sending in a lot of U.S. troops to letting our regional allies send in their troops. I could go on almost every single issue. Mr. Trump has staked out positions on both sides over the year so often that you realize he has no belief system, no knowledge, no animating philosophy other than he is brilliant and you and I are stupid if we don’t like him. The Reagan approach linked the strategies I listed at the outset. Conservatism acknowledges man’s role in “conserving” fundamental rights that flow from our creator, rights of Life, Liberty, and the Pursuit of Happiness. This role of conservatism is not the exclusive domain of a cabal of right wing elite, in Reagan’s view, it belongs to everyone, regardless of race, religion, or creed. 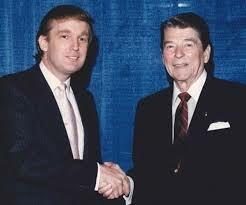 Conservatism was not only logical to Ronald Reagan, it was and is the path to national prosperity and moral living. He saw conservative principles as the path to uniting a diverse nation that wants to leave their kids better off than they were. Donald Trump doesn’t think this way, assuming he thinks at all. By his meandering policy positions and unrelenting smears and put downs of his growing list of adversaries, he proves that old adage that “a sucker is born every minute.” How else can you explain his cultish support? Terrific analysis, Tom! He is suffused with bluster, bravado, and bullying!! The nicest thing that can be said is that he “lacks the temperament” to be president of the United States. Kimberly Strassel of the WSJ pretty much “has his number” regarding his schtick! !